Irene Duclos was a poet and painter who has captured the imagination of modern-day women across the globe. This Duclos painting hangs in the Salone dell’Ottocento amidst ‘memories’ of Canova and Bartolini. You’ll find this large oil-on-canvas, Copy of Andrea del Sarto’s Madonna del Sacco by eighteenth-century Florentine painter Irene Parenti Duclos (1754–1795) hanging right above the door. An artist who trained other women and managed her own workshop, Duclos was also successful copy artist who was granted permission to execute 39 oil copies at the Uffizi from 1773 to 1793. She completed her first at the age of 19. The Uffizi was a far more liberal venue than the Louvre when it came to allowing women to copy in their hallowed hall—sometimes without a bodyguard or with special privileges. In a world yet without photography, copy artists played a fundamental role in increasing the marketability of art thanks to commissions from Grand Tour travelers. The Medici dynasty, which ruled Florence from 1434 to 1743, was generous and liberal in their patronage of artists, both men and women. Second only to the papacy in terms of political power within the Italian peninsula, the Medici transformed Florence into a meeting place for renowned thinkers and artists. Duclos was also a poet who participated in the city’s many literary salons and she represented a beacon of culture in her era. The Duclos conference shed light on the artist as an exponent of the Age of Enlightenment. How did Duclos climb to the top of Santissima Annunziata Church to trace a fresco? Duclos was a member of Europe’s first drawing academy, founded in Florence with Medici initiative. 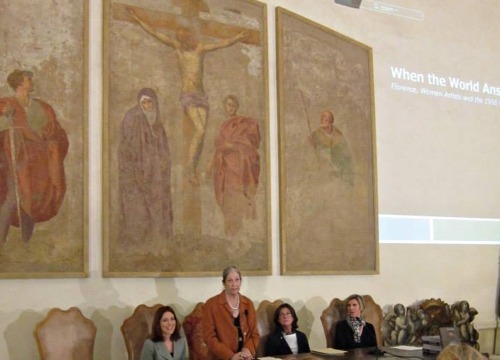 Restorer Rossella Lari's offers an analysis of Duclos' painting technique.